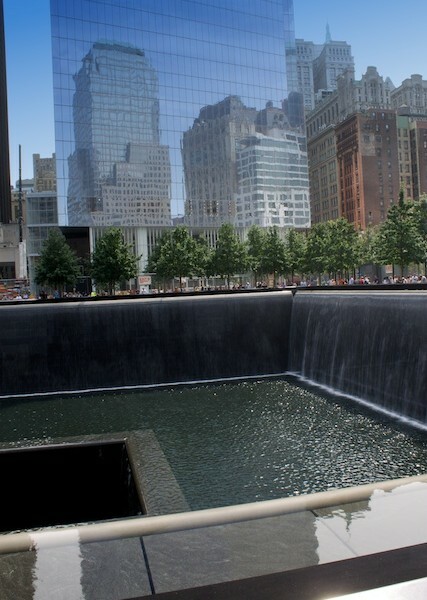 The September 11 Memorial was a clear must-see for us as members of Generation Y, with childhoods undoubtedly shaped by the tragic events of that day. The newly-opened memorial is a fitting tribute to the heroes and lives lost that day. At the time of our visit, construction was still progressing on a permanent museum and the dramatic Freedom Tower adjacent to the memorial. The waterfalls and pools in the footprint of the 2 former towers are magnificent in both scale and beauty. The sound of the moving water is soothing amidst the clammer of a bustling city. We utilized the advanced reservation system offered on the 9/11 Memorial website, which allows you to select an entry time and skip an entry line for $2 per pass. If you have a printer, you can report directly to the memorial site. Unfortunately, we made our reservation after leaving on our trip and needed to pick-up our reservation pass at the “Preview Site”, which is quite a detour and required waiting in a queue that was longer than the non-reservation line at the site that day. Make sure an look for the brochure guide after entering the site, which provides good background information on the memorial (we missed it at first in anticipation of checking-out the pools). 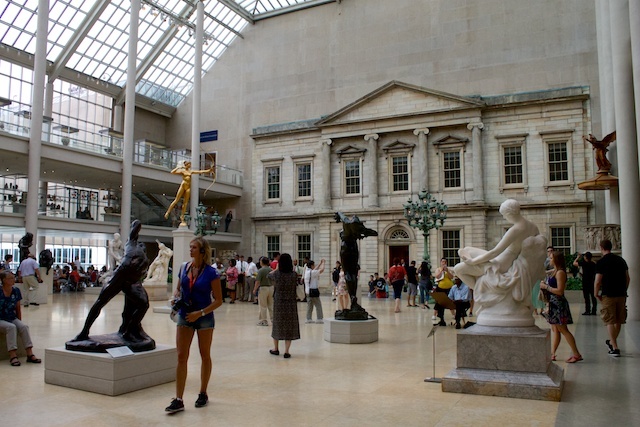 We wanted to visit at least one museum on our NYC trip, and after reviewing our options, the Met (short for Metropolitan Museum of Art) seemed like the obvious choice. The size, variety, and significance of the Met’s collections astounded us. Having visited the Louvre, the Prado, and other famous European art museums, we decided to focus our tour on American art. The museum’s American Wing features gorgeous landscapes (our favorite was one of the Andes), prime examples of American impressionism, and even stained glass pieces by Louis Tiffany. In addition, they have amazing artifacts from Greece, Asia, and an impressive European art collection of their own. We finished our visit with a stop at the rooftop bar, which offers excellent panoramic views of Central Park. The Met offers “pay as you wish” admission, with a suggested donation of $25. 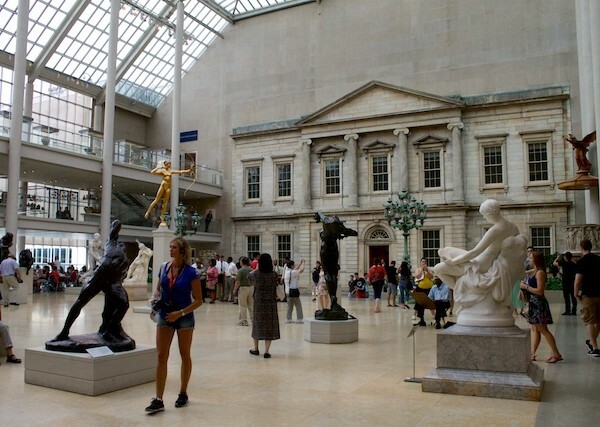 Although expensive, the comprehensive exhibits at the Met may warrant the high price tag. Our ticket agent was very forward with allowing us to pay an amount we deemed appropriate. Since we weren’t spending the whole day at the Met, we decided $12 each would be sufficient. We definitely plan on returning on our next visit. During our half-day visit, we didn’t cover more than 5% of what the museum had to offer. The Empire State Building wasn’t on our original itinerary. The high cost ($27/person to the 86th floor) and long lines deterred us. However, after a broadway show, an excellent peruvian dinner, and many glasses of wine, it somehow seemed like a good idea for us to walk 2 miles across Manhattan to catch the last elevator up the Empire State Building at 1:30am! I’m glad we did! 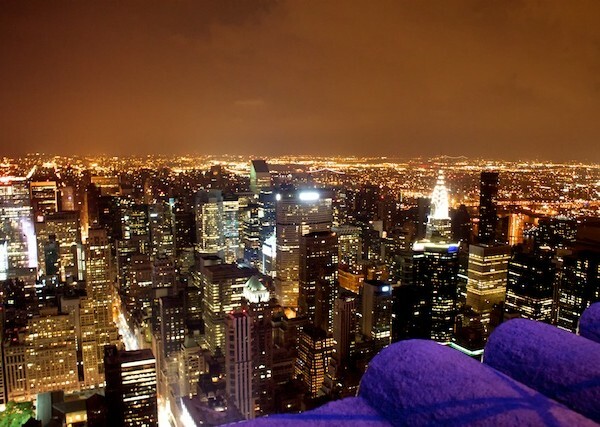 Remarkably, the observation deck at the Empire State Building is open until 2am every night, with the last elevator leaving around 1:30am. Not surprisingly, we found absolutely no lines and were virtually alone on the observation deck. 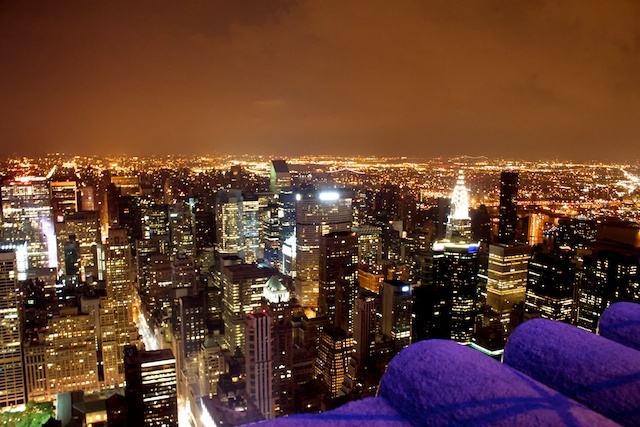 I had previously viewed NYC from the Top of the Rock observation deck, but the vantage point is really no comparison to what is offered at the top of the Empire State Building. For $44/person, visitors are offered a view from the 102nd floor, but I would doubt that the extra 16 floors is worth the expense. This entry was posted in Things To Do, Travel and tagged experience, New York, New York City 2013 Trip, United States by Ryan. Bookmark the permalink.